Custom Plastic Gift Cards, Loyalty Cards, Membership Cards and Key Tags. This is Plastic Card City, where customers receive all-inclusive no nonsense pricing. That means we provide design services, online proofs, and set-up fees at NO additional cost. We are in the plastic card printing business and experience tells us every business can benefit from advice given by our marketing professionals. We can help with your plastic card project, be it gift cards programs, fundraising programs, loyalty programs, or membership programs. Plastic Card City is sure to provide the solution. 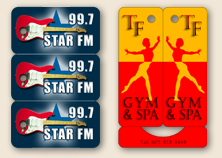 Our specialty is manufacturing plastic key tags and custom plastic cards. 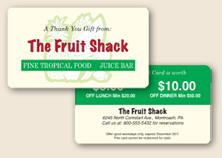 Quality printed gift cards are ideal marketing tools for any retail endeavor. They are cost effective and have many benefits for advertising, building your brand, and increasing revenue. Plastic Card City takes pride in delivering top quality printing and tight quality controls. We print all our products in the U.S. We offer multiple substrates such as PVC, laminated card stock, or laminated Teslin. It goes without saying the card needs to stand out by looking good and being durable. We never compromise and will always provide your gift card program at the lowest possible cost. Key tags are strategic when it comes to creating and running an affordable loyalty or rewards program. They are extremely popular because of their convenience, and can be found everywhere. Plastic key tags are the most effective of all tools in a loyalty program. 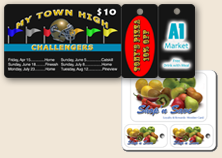 Our art department has award-winning professionals with vast marketing and advertising agency experience to make your key tags draw attention to your brand, promote your products and services as well as any other marketing project geared toward customer retention. Plastic Card City is committed to delivering cards and tags of the highest quality. To that end, we want our customers to understand what the process entails. 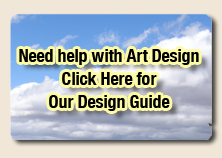 For this reason we offer plastic card printing artwork guidelines. We also are not satisfied until we match your needs to the best technology available. We are committed to solutions for plastic printing, card stock printing, card presentation methods and tracking software. Plastic Card City strives to deliver not only the best product, but also the most up to date technology at the lowest price. Fundraising projects utilizing plastic cards have been increasing in popularity in recent years because of their high return on investment and effectiveness. Printing multiple offers on the small space a card offers has been a challenge. Plastic card City has been working to find the best design practices to achieve this goal. We have established methods that create stunning looking cards with clear readable text and the maximum amount of offers possible. In doing so we have eliminated the need for our customers to do the designs themselves. All they have to do is send us the offers in a Word document and we do the rest. We do more than just paper and plastic card printing. Additionally, we print products such as card presenter/holders, stickers, posters, clear business cards, and considerably more. We are committed to providing extra value with the high quality at the lowest possible price; along with expert advice based on solid knowledge of current trends, for our customer’s success. Plastic Card City wishes you to return with all your needs. We want you to know we appreciate your business, and do the best we can to earn it. Marketing in the current economy becomes a very important when trying to keep a business running or to assure success when opening a new business. There are two very important elements in your marketing efforts that a plastic card printing program can help with. One: Acquiring new customers. Well-designed gift cards are a powerful tool for this purpose. You will need to advertise that you offer gift cards. And then suggest them to your best customers and new customers. 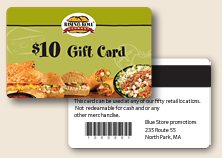 And last, give out free set-price discount gift cards to spread the word about your business and attract new customers. Two: Retain your current customers and encourage them to come back and purchase more. This is done with a loyalty card system. Offer the cards and set rewards for frequent buying or visits to your business. These methods of enhancing your marketing plans have been used extremely successful in many industries. Additional information about these success stories can be found all over the Internet. Customer loyalty card printing with online tracking software are our top selling products. 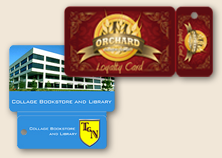 Rewards, loyalty and gift card programs can be easily started with the Card City Solutions low cost software. Set up takes minutes and the program is simple to use. Due to the increasing demand for key tags by churches nationwide, we have increased our production abilities. More and more churches are now using key tags and software to track membership visits and to increase the safety of children attending church activities. Our popular software's new release is now available for the Apple iPad. Bar codded cards are readable via a Bluetooth bar code scanner. Running a loyalty, rewards or gift card program has never been easier or cheaper. Click here for details. Card City Software launches a reseller program. The popular software is now available to resellers displaying the resellers branding with logos and contact information. Card City Software announces another feature the program. Now you can create a report with any date range, create daily, weekly, monthly or yearly reports by selecting two dates. In addition the bug in Internet Explorer has been fixed. Card City Software announces a new update to the popular gift, rewards and loyalty tracking program. The new update allows for adding customer information after the card is activated even when the card is not present. Plastic Card City launches the new Card City Software site offering Loyalty and Gift Card programs. New Birthday Marketing program is offered. This new program is designed to target people with upcoming birthdays by offering discount cards in an attractive mailing piece.